Are negative people bringing you down? Do you have an exit strategy when you encounter negative people? Would you like to surround yourself with positive folks? Here ya go. Great article from Hack Spirit. Nine ways to protect yourself from negativity. If you’ve ever spent some time with a negative person, you know how quickly you can start to take on that negative mentality. Have you ever felt that you wish you had known how to protect yourself from negative energy? Here is how to protect yourself from absorbing other people’s negative energy so you can get on with living a more positive and productive life. When negative emotion takes over, it’s important to identify the source. Is it your own negative emotion or did you pick it up from someone else? If it is yours, then you can deal with it and work through those emotions, but if it is someone else’s, you need to recognize that it’s not your burden to carry and let it go. Go outside, take a walk, eat lunch in your car: whatever you have to do to give yourself some space away from the negativity and the negative people, do it. Sometimes, all you need is a few minutes to regroup your thoughts and remind yourself that their negativity is not your negativity. When it comes to dealing with negativity and negative energy, it’s important to know what triggers that feeling in you. When you can identify a feeling associated with negativity, you can identify it sooner and deal with it faster. 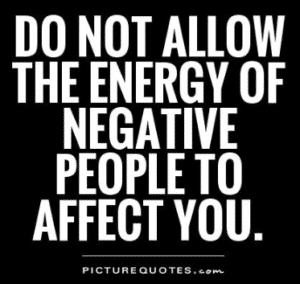 If that negativity is associated with a person, you can see it coming from a mile away and start walking in the other direction. Click here for remaining 6 ways.